New York, NY – October, 29, 2018 – The CUNY School of Professional Studies (CUNY SPS) is proud to announce that MS in Disability Services in Higher Education student Leonard Blades has been appointed to serve as Vice Chair of Disabled Student Affairs on the University Student Senate (USS) Steering Committee for the 2018-2019 academic year. 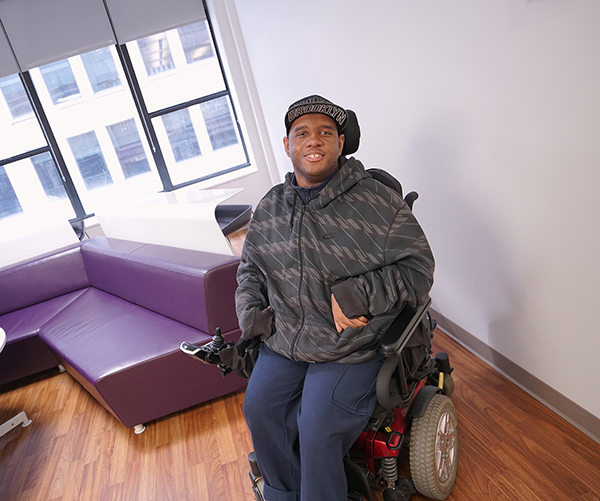 The USS Plenary unanimously elected Blades to this position due to his extensive personal experience with disability combined with the leadership and advocacy he has exercised on behalf of students with disabilities in the CUNY community. In addition to currently serving as the USS graduate delegate, Blades is an active member of the School’s Student Association, Accessibility and Inclusion Committee, Abilities and Resources Committee, Professional Development Grant Committee, and Special Events Committee. In his new position, Blades plans to advocate for multiple platforms affecting CUNY students with disabilities, including ensuring equal access to technology fee benefits, developing a publicized emergency evacuation plan, encouraging faculty to develop a “disability statement” on all syllabi, and lobbying the NYS Legislature for an increased contribution to the Americans with Disabilities Act lump sum allocation to CUNY. The University Student Senate of CUNY was founded in 1972 with the mission of preserving the accessibility, affordability, and excellence of higher education within the University. The organization is charged with protecting the rights of the student body, furthering the cause of public higher education, and promoting the general welfare of its student constituents and the University. The USS delegates are responsible for the representative governance of the 500,000 students of the 25 CUNY campuses. Home to the first fully online degree programs at the City University of New York, the CUNY School of Professional Studies provides online and on campus programs that meet the needs of adults who are looking for a seamless way to finish a bachelor’s degree, earn a master’s degree or certificate in a specialized field, advance in the workplace, or change careers. Affirming its role as a leader in online education, CUNY SPS was ranked in the top 5% in the Nation in U.S. News & World Report’s list of the 2018 Best Online Bachelor’s Degree Programs. Of the institutions listed, CUNY SPS ranks 1st in New York State.